At the height of the 1991 Gulf War, 300 clicks into the heart of Iraq, you must command your squad of Special Forces operatives to strike at the evil Iraqi dictator's fascist regime. Advanced squad based combat with more levels, more weapons, smarter enemies and tougher squadmates than the original. The troops are in position, so lock and load, and get ready to go loud! In a conflict that lasted 11 years and took more than three million lives, four men are going to experience the longest 28 days ever. Cut off behind enemy lines during the 1968 Tet Offensive with no way to contact help, four young, barely trained sol.. Conflict: Global Terror is set in the very near future and focuses on the increasing threat of terrorism gripping the World. Developed by Bath-based Pivotal Games, Conflict: Global Terror takes the Conflict brand in a new direction from previous inst.. 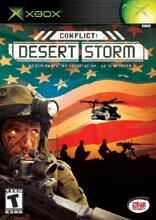 Conflict: Desert Storm lets you lead one of the best known and most feared special operations forces in the world: the elite British SAS or the US Delta Force. Covert missions take you through hostile environments where only your expertise in stealth.. Racing sim from Microsoft, targeted at gamers who are passionate about cars and racing. Own, customize, and race your favorite cars in the most technologically advanced and realistic driving sim yet. ..